Onslow gardens was a great first project, a small two bedroom property situated on a pretty garden square. The internal works where fairly basic, we removed a wall and ceiling to open up the kitchen and create a open plan living area. The brief was to create a home for young professionals that would be working long hours and would be eating out regularly or perhaps as a pied-à-terre for a family down sizing. 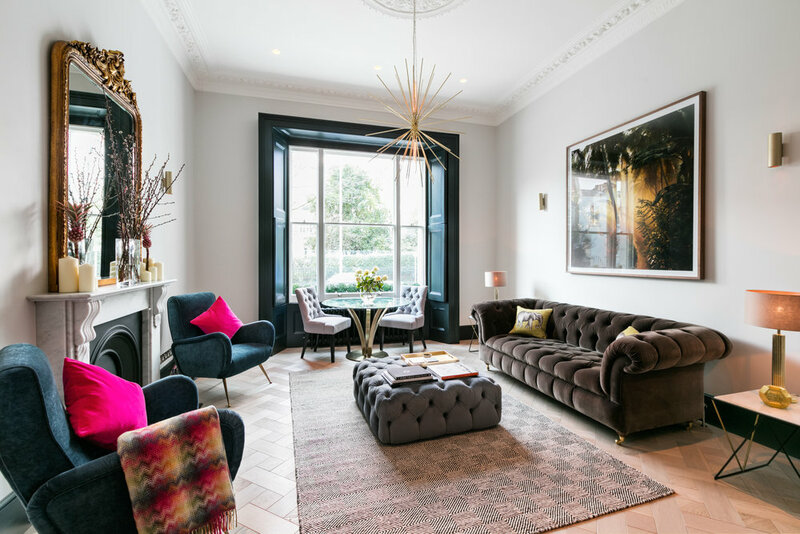 We wanted to reference the character of the building with its beautiful high ceilings and intricate cornicing but also add a modern fresh feel to the home. The all black kitchen was designed to look like a piece of furniture such as a bar or drinks cabinet and less like a kitchen. Although the kitchen is small and compact we were still able to install a full size fridge freezer, dishwasher, oven, microwave,hob and lots of storage to make this a fully functional and practical kitchen space. The best original feature of the property was the large west facing sash window. To highlight this feature I took the decision to paint the frame in Farrow and Ball 'Black blue ' which frames the beautiful view and has the effect of drawing your eye immediately to the window. I feel this is a well balanced space with maximum use of the relatively small living area, by keeping the space as open as possible and not cluttered with furniture the we have kept this room feeling grand and opulent but still incorporating kitchen, dining and living areas.